"Belly dancer" redirects here. For other uses, see Belly dancer (disambiguation). The term "belly dance" is a translation of the French term "danse du ventre", which was applied to the dance in the Victorian era, and referred to Egyptian and Middle Eastern female dances. In Arabic, the dance is known as Raqs Sharqi ("Eastern Dance") or as Raqs Baladi in Egyptian Arabic ("Country Dance" or "Folk Dance"). Dalilah filming Keyf Ansak in Cairo, Egypt 1957. Belly dance is primarily a torso-driven dance, with an emphasis on articulations of the hips. Unlike many Western dance forms, the focus of the dance is on isolations of the torso muscles, rather than on movements of the limbs through space. Although some of these isolations appear similar to the isolations used in jazz ballet, they are sometimes driven differently and have a different feeling or emphasis. In common with most folk dances, there is no universal naming scheme for belly dance movements. Some dancers and dance schools have developed their own naming schemes, but none of these is universally recognized. Percussive movements: Staccato movements, most commonly of the hips, used to punctuate the music or accent a beat. Typical movements in this group include hip drops, vertical hip rocks, outwards hip hits, hip lifts and hip twists. Percussive movements using other parts of the body can include lifts or drops of the ribcage and shoulder accents. Fluid movements: Flowing, sinuous movements in which the body is in continuous motion, used to interpret melodic lines and lyrical sections in the music, or modulated to express complex instrumental improvisations. These movements require a great deal of abdominal muscle control. Typical movements include horizontal and vertical figures of 8 or infinity loops with the hips, horizontal or tilting hip circles, and undulations of the hips and abdomen. These basic shapes may be varied, combined and embellished to create an infinite variety of complex, textured movements. Shimmies, shivers and vibrations: Small, fast, continuous movements of the hips or ribcage, which create an impression of texture and depth of movement. Shimmies are commonly layered over other movements, and are often used to interpret rolls on the or riq or fast strumming of the oud or qanun (instrument). There are many types of shimmy, varying in size and method of generation. Some common shimmies include relaxed, up and down hip shimmies, straight-legged knee-driven shimmies, fast, tiny hip vibrations, twisting hip shimmies, bouncing 'earthquake' shimmies, and relaxed shoulder or ribcage shimmies. In addition to these torso movements, dancers in many styles will use level changes, travelling steps, turns and spins. The arms are used to frame and accentuate movements of the hips, for dramatic gestures, and to create beautiful lines and shapes with the body, particularly in the more balletic, Westernised styles. Other movements may be used as occasional accents, such as low kicks and arabesques, backbends, and head tosses. Belly dancing is believed to have had a long history in the Middle East, but reliable evidence about its origins is scarce, and accounts of its history are often highly speculative. Several Greek and Roman sources including Juvenal and Martial describe dancers from Asia Minor and Spain using undulating movements, playing castanets, and sinking to the floor with "quivering thighs", descriptions that are certainly suggestive of the movements that are today associated with belly dance. Later, particularly in the 18th and 19th centuries, European travellers in the Middle East such as Edward Lane and Flaubert wrote extensively of the dancers they saw there, including the Awalim and Ghawazee of Egypt. In the Ottoman Empire belly dance was performed by both boys and women in the Sultan's palace. Belly dance in the Middle East has two distinct social contexts: as a folk or social dance, and as a performance art. As a social dance, belly dance (also called Raqs Baladi or Raqs Shaabi in this context) is performed at celebrations and social gatherings by ordinary people (male and female, young and old), in their ordinary clothes. In more conservative or traditional societies, these events may be gender segregated, with separate parties where men and women dance separately. Historically, professional dance performers were the Awalim (primarily musicians and poets), Ghawazi, and Köçekler. The Maazin sisters may have been the last authentic performers of Ghawazi dance in Egypt, with Khayreyya Maazin still teaching and performing as of 2009. In the modern era, professional performers (including dancers, singers, and actors) are not considered to be respectable in the Middle East, and there is a strong social stigma attached to female performers in particular, since they display their bodies in public, which is considered haram in Islam. Many bellydancers work in Cairo. The modern Egyptian belly dance style (and the modern costume) are said to have originated in Cairo's nightclubs then been used in Egyptian cinema. Many of the local dancers went on to appear in Egyptian films and had a great influence on the development of the Egyptian style and became famous like Samia Gamal and Taheyya Kariokka both of whom helped attract the eyes to Egyptian style worldwide. Egyptian belly dance is noted for its controlled, precise movements. Turkish belly dance is referred to in Turkey as Oryantal Dans, or simply 'Oryantal'. The Turkish style of bellydance is lively and playful, with a greater outward projection of energy than the more contained Egyptian style. Turkish dancers are known for their energetic, athletic (even gymnastic) style, and their adept use of finger cymbals, also known as zils. Connoisseurs of Turkish dance often say a dancer who cannot play the zils is not an accomplished dancer. Floorwork, which has been banned in Egypt since the mid-20th century, is still an important part of Turkish bellydance. Another distinguishing element of Turkish style is the use of a 9/8 rhythm, counted as 12-34-56-789, often referred to as Karsilama rhythm. Karşilama, in Turkish dance, is not a rhythm but a folkdance performed in a line, where as a 9/8 (dokuz sekiz) rhythm defines the count of the rhythm and is used both karşilama and Roman havasi. Lebanese style belly dance is somewhere between the Egyptian and Turkish styles. Lebanese dance takes from the classic oriental dance, but still incorporates a feisty, modern edge. There are large steps, backward leans to the torso, twisting hip rotations, large and busy arms and lots of shimmies. The types of techniques that are used in Lebanese style dance are quick layered shimmies and subtle internal movements. Lebanese dancers sometimes include kicks, splits, deep back bends, and Turkish drops. Belly dance was popularized in the West during the Romantic movement of the 18th and 19th centuries, when Orientalist artists depicted romanticized images of harem life in the Ottoman Empire. Although there were dancers of this type at the 1876 Centennial in Philadelphia, it was not until the 1893 Chicago World's Fair that it gained national attention. The term "belly dancing" is often credited to Sol Bloom, its entertainment director, but referred to the dance as danse du ventre, the name used by the French in Algeria. In his memoirs, Bloom states, "when the public learned that the literal translation was "belly dance", they delightedly concluded that it must be salacious and immoral ... I had a gold mine." Authentic dancers from several Middle Eastern and North African countries performed at the Fair, including Syria, Turkey and Algeria—but it was the dancers in the Egyptian Theater of The Street in the Cairo exhibit who gained the most notoriety. The fact that the dancers were uncorseted and gyrated their hips was shocking to Victorian sensibilities. There were no soloists, but it is claimed that a dancer nicknamed Little Egypt stole the show. Some claim the dancer was Farida Mazar Spyropoulos, but this fact is disputed. The popularity of these dancers subsequently spawned dozens of imitators, many of whom claimed to be from the original troupe. Victorian society continued to be affronted by the dance, and dancers were sometimes arrested and fined. The dance was nicknamed the "Hoochie coochie", or the shimmy and shake. A short film, "Fatima's Dance", was widely distributed in the Nickelodeon theaters. It drew criticism for its "immodest" dancing, and was eventually censored. Belly dance drew men in droves to burlesque theaters, and to carnival and circus lots. Thomas Edison made several films of dancers in the 1890s. These included a Turkish dance, and Crissie Sheridan in 1897, and Princess Rajah from 1904, which features a dancer playing zills, doing "floor work", and balancing a chair in her teeth. Ruth St. Denis also used Middle Eastern-inspired dance in D. W. Griffith's silent film Intolerance, her goal being to lift dance to a respectable art form at a time when dancers were considered to be women of loose morals. Hollywood began producing films such as The Sheik, Cleopatra, and Salomé, to capitalize on Western fantasies of the orient. When immigrants from Arab States began to arrive in New York in the 1930s, dancers started to perform in nightclubs and restaurants. In the late 1960s and early '70s many dancers began teaching. Middle Eastern or Eastern bands took dancers with them on tour, which helped spark interest in the dance. Although using Turkish and Egyptian movements and music, American Cabaret ("AmCab") belly dancing has developed its own distinctive style, using props and encouraging audience interaction. In 1987, a distinctively American style of group improvisational dance, American Tribal Style Belly Dance, (ATS), was created. Although a unique and wholly modern style, its steps are based on existing dance techniques, including those from North India, the Middle East, and Africa. Many forms of "Tribal Fusion" belly dance have also developed, incorporating elements from many other dance and music styles including flamenco, ballet, burlesque, hula hoop and even hip hop. "Gothic Belly Dance" is a style which incorporates elements from Goth subculture. Belly dancers are thought to have come to Spain from Lebanon in the time of the Phoenicians (11th Century BC to 5th Century BC). 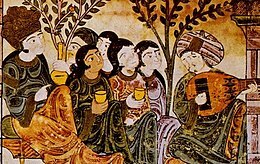 When Arab family of the Umayyad came to Spain, they sent Basque singers and dancers to Damascus and Egypt for training in the Middle Eastern style. These dancers came to be known as Al Andalus dancers. It is theorised that the fusion of the Al-Andalus style with the dances of the Gypsies led to the creation of flamenco. Belly dance did not return to Spain until the 1980s, with the end of the Catholic regime of Franco. The first wave of interest in belly dancing in Australia was during the late 1970s to 1980s with the influx of migrants and refugees escaping troubles in the Middle East, including drummer Jamal Zraika. These immigrants created a social scene including numerous Lebanese and Turkish restaurants, providing employment for belly dancers. Rozeta Ahalyea is widely regarded as the "mother" of Australian belly dance, training early dance pioneers such as Amera Eid and Terezka Drnzik. Belly dance has now spread across the country, with belly dance communities in every capital city and many regional centres. Belly dance has been in evidence in the UK since the early 1960s. During the 1970s and 1980s, there was a thriving Arabic club scene in London, with live Arabic music and belly dancing a regular feature, but the last of these closed in the early 1990s. Several prominent members of the British belly dance community began their dance careers working in these clubs. Today, there are fewer traditional venues for Arabic dance in the UK; however, there is a large amateur belly dance community. Several international belly dance festivals are now held in Britain. In addition, there are a growing number of competitions, which have increased in popularity in recent years. The UK belly dance scene leans strongly towards the Egyptian/Arabic style, with little Turkish influence. American Tribal Style and Tribal Fusion belly dance are also popular. The costume most commonly associated with belly dance is the 'bedlah' (Arabic: بدلة‎; literally "suit") style, which typically includes a fitted top or bra, a fitted hip belt, and a full-length skirt or harem pants. The bra and belt may be richly decorated with beads, sequins, crystals, coins, beaded fringe and embroidery. The belt may be a separate piece, or sewn into a skirt. Badia Masabni, a Cairo cabaret owner during the early 20th century, is credited with creating the modern bedlah style. It has been suggested that the bedlah was inspired by glamorous Hollywood costuming, or created to appeal to Western visitors. Earlier costumes were made up of a full skirt, light chemise and tight cropped vest with heavy embellishments and jewelry. As well as the two-piece bedlah costume, full length dresses are sometimes worn, especially when dancing more earthy baladi styles. Dresses range from closely fitting, highly decorated gowns, which often feature heavy embellishments and mesh-covered cutouts, to simpler designs which are often based on traditional clothing. In Egypt dancers wear a bedlah. Alternatively they may wear a dress with mesh-filled cutouts. As there is no prohibition on showing the abdomen in Lebanon, the bedlah style is more common. The skirts tend to be more sheer than Egyptian outfits, showing more of the dancer's body. The veil is more widely used than in Egypt. High heels are commonly worn. Lebanese dancers have more freedom than Egyptian style dancers in the type of costume they choose to wear. Turkish costumes are usually in the bedlah style. Distinctive features of many Turkish costumes include a V-shaped or triangular belt which may be shaped or contoured around the top edge, and a great deal of embellishment and beaded fringing on both the bra and the belt. Skirts are often fuller than their Egyptian counterparts, and are likely to be made of chiffon or velvet rather than lycra. In the 1980s and '90s a very revealing costume style developed with skirts designed to display both legs up to the hip, and plunging bras or even pasties. Such styles still exist in some venues but there are also many Turkish belly dancers who wear more moderate costumes. Even so, many Turkish belly dance costumes reflect the playful, flirty style of Turkish belly dance. Tribal belly dance costumes draw inspiration from traditional folkloric costumes across the globe and include circle skirts, pantaloons, and turbans or headdresses decked with feathers or flowers. Belly dance is a non-impact, weight-bearing exercise and is thus suitable for all ages. Many of the moves involve isolations, which improves flexibility of the torso. Belly dance moves are beneficial to the spine, as the full-body undulation moves lengthens (decompress) and strengthens the entire column of spinal and abdominal muscles in a gentle way. The titular character of the Shantae series of video games developed by Wayforward Technologies is a belly dancing "half-genie", who uses magical belly dances to transform into various animals. The Brazilian telenovela O Clone (also known as El Clon in Spanish-speaking countries and the United States) is set in Brazil and Morocco and featured belly dancing in many episodes. The lead character, Jade (Giovanna Antonelli), used it to entice her lover Lucas (Murilo Benício) and to soothe and seduce her husband Said (Dalton Vigh). Several James Bond films (including From Russia with Love) and music videos have featured belly dancers. In The Man with the Golden Gun, the belly dancer Saida wears a spent bullet in her navel, which Bond accidentally swallows while trying to retrieve it. Documentaries about belly dance include American Bellydancer, Journey of Desire: A Foreign Dancer in Cairo, Belly, Sensual... Scarred... Sacred, and Bellydancers of Cairo. ^ Trier-Bieniek, Adrienne (2015). Feminist Theory and Pop Culture. Springer. p. 4. ^ Murray, Edmundo (2015). A Symphony of Flavors: Food and Music in Concert. Cambridge Scholars Publishing. p. 34. ^ Snodgrass, Mary Ellen (2016). The Encyclopedia of World Folk Dance. Rowman & Littlefield. ISBN 9781442257498. ^ editor, Justine J. Reel, PHD, LPC, CC-AASP (2013). Eating disorders : an encyclopedia of causes, treatment, and prevention. Santa Barbara, Calif.: Greenwood. ISBN 978-1440800580. ^ Buonaventura, Wendy (2010). Serpent of the Nile : women and dance in the Arab world ([Newly updated ed.] ed.). London: Saqi. ISBN 978-0863566288. ^ Hammond, Andrew (2007). Popular culture in the Arab world : arts, politics, and the media (1. publ. ed.). Cairo, Egypt: American University in Cairo Press. ISBN 978-9774160547. ^ Fraser, Kathleen W. (31 October 2014). Before They Were Belly Dancers: European Accounts of Female Entertainers in Egypt, 1760-1870. McFarland. ISBN 9780786494330. ^ a b Deagon, Andrea. "Andrea Deagon's Raqs Sharqi". ^ Varga Dinicu, Carolena (2011). You Asked Aunt Rocky: Answers & Advice About Raqs Sharqi & Raqs Shaabi. Virginia Beach, VA, USA: RDI Publications, LLC. p. 218. ISBN 978-0-9830690-4-1. ^ Wise, Josephine (2012). The JWAAD Book of Bellydance. Croydon, UK: JWAAD Ltd. pp. 60–104. ISBN 978-0-9573105-0-6. ^ Buonaventura, Wendy (1989). Serpent of the Nile: Women and Dance in the Arab World. Saqi. p. 13. ISBN 978-0-86356-628-8. ^ Buonaventura, Wendy (1989). Serpent of the Nile: Women and Dance in the Arab World. Saqi. pp. 56–76. ISBN 978-0-86356-628-8. ^ "A Question of Köçek – Men in Skirts". Azizasaid. ^ Wise, Josephine (2012). The JWAAD Book of Bellydance. JWAAD Ltd. p. 11. ISBN 978-0-9573105-0-6. ^ Al-Rawi, Rosina Fawzia (1999). Grandmother's Secrets: The Ancient Rituals and Healing Power of Belly Dancing. Interlink Books. pp. 20–22. ISBN 978-1-56656-302-4. ^ Gilded Serpent "The Ghawazee: Back from the Brink of Extinction". ^ van Nieuwkerk, Karin (1995). A Trade Like Any Other: Female Singers and Dancers in Egypt. University of Texas Press. ISBN 978-9774244117. ^ "Bellydance Styles: Egyptian Raqs Sharqi". BellydanceU.net. ^ "buzz words and dancers". Belly Dance Forums. Retrieved 10 May 2016. ^ Mourat, Elizabeth 'Artemis'. "Turkish Dancing". ^ "LEBANESE BELLY DANCE". babayagamusic.com. Retrieved 12 May 2016. ^ Donna Carlton (1995) Looking for Little Egypt. Bloomington, Indiana: International Dance Discovery Books. ISBN 0-9623998-1-7. ^ "NO MORE MIDWAY DANCING; THREE OF THE EGYPTIAN GIRLS FINDED EACH. Manager Delareix, Disgusted at New-York's Benighted Taste, Declared He Would Seek a More Cultured City--By Evening He Had Thought Better of It, and His". 7 December 1893 – via NYTimes.com. ^ "Crissie Sheridan / Thomas A. Edison, Inc". hdl.loc.gov. ^ "Princess Rajah dance / American Mutoscope and Biograph Company". hdl.loc.gov. ^ a b "About Tribal Bellydance". Tribalbellydance.org. ^ Asmahan of London. "Gilded Serpent, Part 1". Gilded Serpent. ^ Asmahan of London. "Gilded Serpent, Part 2". Gilded Serpent. Retrieved 18 February 2013. ^ "Belly Dance Costumes". Orientaldancer.net. ^ Dallal, Tamalyn (2004). Belly Dancing For Fitness. Berkley: Ulysses Press. ISBN 9781569754108. ^ Lo Iacono, Valeria. "WorldBellydance.com".